A letter from U.S. Army Major General F. E. Uhl to Edna P. Hancock dated May 10, 1945. In the letter, Maj. Gen. Uhl offers condolences to Hancock regarding the death of her husband, Sergeant John B. Hancock (1913-1944), while serving in World War II. Maj. Gen. Uhl also offers the services of the Welch Convalescent Hospital in Daytona Beach, Florida, for families of fallen soldiers. Photocopy of original 1-page typewritten letter from F. E. Uhl to Edna P. Hancock, May 10, 1945: Private Collection of Linda Hughes. Digital reproduction of photocopied 1-page typewritten letter from F. E. Uhl to Edna P. Hancock, May 10, 1945. Originally created by F. E. Uhl. 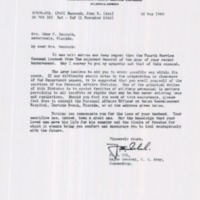 Uhl, F. E.. “Letter from F. E. Uhl to Edna P. Hancock (May 10, 1945).” RICHES of Central Florida accessed April 23, 2019, https://richesmi.cah.ucf.edu/omeka/items/show/9313.